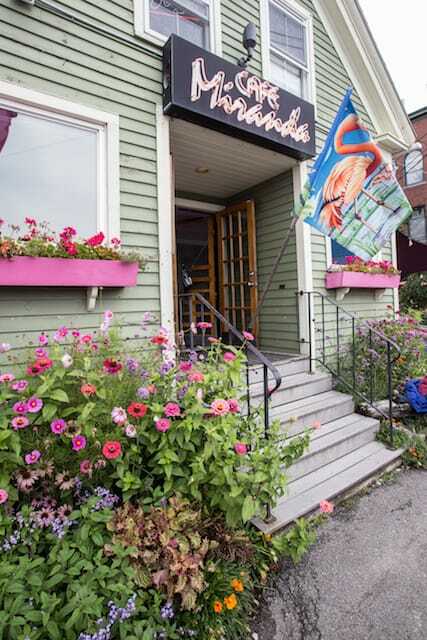 Having it All at Cafe Miranda in Rockland, Maine | Good. Food. Stories. Since our regular visits to Maine are typically a go-with-the-flow situation, I don’t often have a lunch spot lined up in advance for our days of gallivanting. 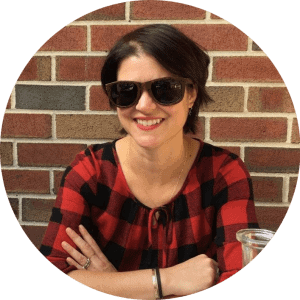 Whether we end up near Camden, Bath, Damariscotta, or any of the other towns along the two-lane roads in the midcoast region, there’s always a tavern making killer sandwiches from scratch or a lobster counter with a few picnic tables for us to stumble upon. Appropriately lauded as the best restaurant for picky eaters by Yankee Magazine, Rockland’s Cafe Miranda is one of those spots with a sprawling menu that defies categorization beyond the tenets of seasonal and local. That’s not to say it lacks a point of view. 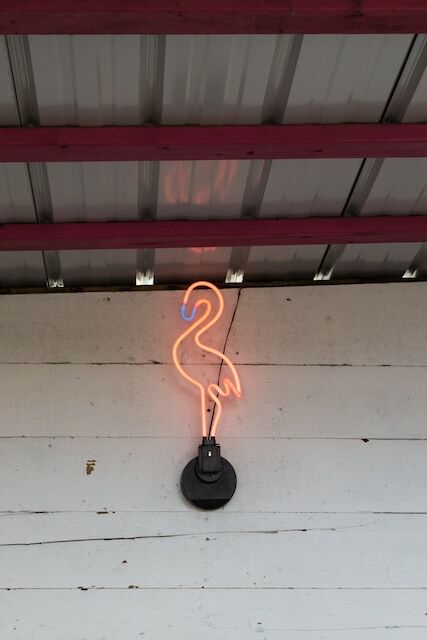 If the flamingos roosting here and there throughout the restaurant—in neon, as a metal planter, and on the flag outside the front door—didn’t give you a sense of the spot’s quirky personality, a quick read-through of the menu will clue you in. For those of us who love food and puns, it’s a feast: part of the fun is spotting dishes named “Mussel Memory” for baked clams in marinara, “Et tu Brutus” salad instead of the empirical Caesar, or a tossed-off mention of “Elvis parsley” in the list of ingredients for an appetizer. 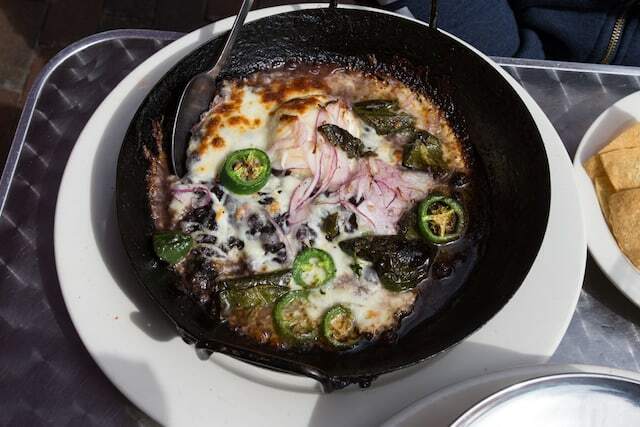 Though the menu is eclectic, the kitchen’s wood-fired oven is the basis for many of Cafe Miranda’s dishes, blazing everything from the haddock in the chowder to the sizzling mac and cheese to the deconstructed nachos—actually, one of the restaurant’s signature double-handled roasting pans filled with a gooey pile of molten cheese, black beans, and roasted poblanos, with wafer-thin onions and jalapeños for crunch. The oven is also the source of the house-made focaccia that’s served in large hunks alongside many meals, whether as the buns for the sandwiches, burgers, and hot dogs (yes, hot dogs, also fire-roasted as they should be) or as a vehicle for hoovering up first-course dips and spreads that could really be a meal on their own. 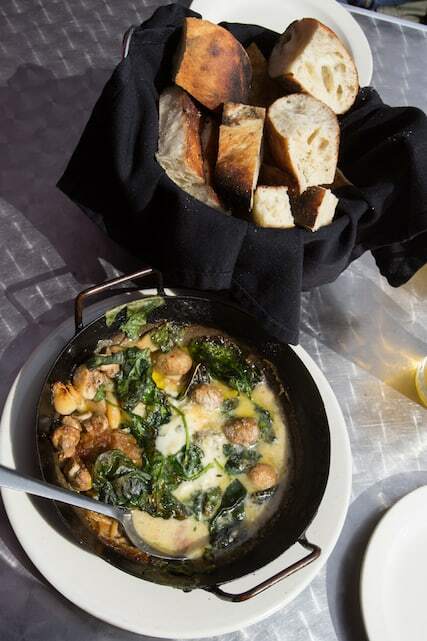 The mushroom and gorgonzola dip, studded with button mushrooms, a tangle of caramelized onions, crisp-at-the-edges spinach leaves, and whole cloves of sweet roasted garlic, was almost all I needed for the afternoon. Almost. But there was local seafood to be sampled, and Cafe Miranda also makes a strong case for the fact that, even though you’re in Maine, it doesn’t have to be all about lobster all the time. It could be about those mussels or roasted haddock, or Maine crab. 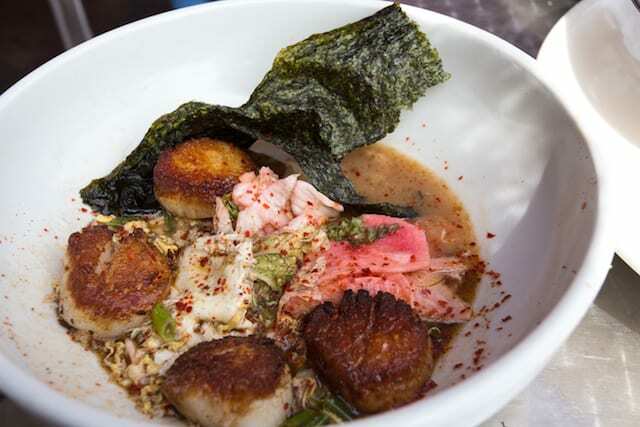 Or a dish titled “Pretty Maids” that lines up a quartet of local scallops in a bowl of spicy, garlicky, gingery broth alongside a softly shredded egg and a pile of watermelon radish kimchi. A sheet of roasted nori that gently waves in the breeze should you be lucky enough to be eating out on the Miranda veranda. With such a vast catalogue of dishes and such generous portions, it’s easy to get overly ambitious and possibly overwhelmed here. (Especially if your picky eater husband doesn’t want to share, which is so often the case in this relationship.) Think of a trip to Cafe Miranda as an opportunity to literally go with your gut. What sounds good today? Why try to second-guess yourself? With this lineup, there’s always reason to return to Rockland. Cafe Miranda, 15 Oak Street, Rockland, ME. 207-594-2034. Open every day, and don’t be discouraged by the wait.